Sepia Saturday: Before Bridezilla Roamed by Jollett etc. Welcome to Part 2 of my Webster family’s visit to the Historic Ulysses S. Grant Home! If you missed Part 1, just click HERE to catch up. We’re finishing up our visit to this historic home with a look at four vintage postcards from my Grandpa Debs’ collection. I hope you’ve enjoyed our little vintage postcard tour of the Historic Ulysses S. Grant Home. In the next installment of my Webster Family’s Road Trip we will find them in South Dakota. 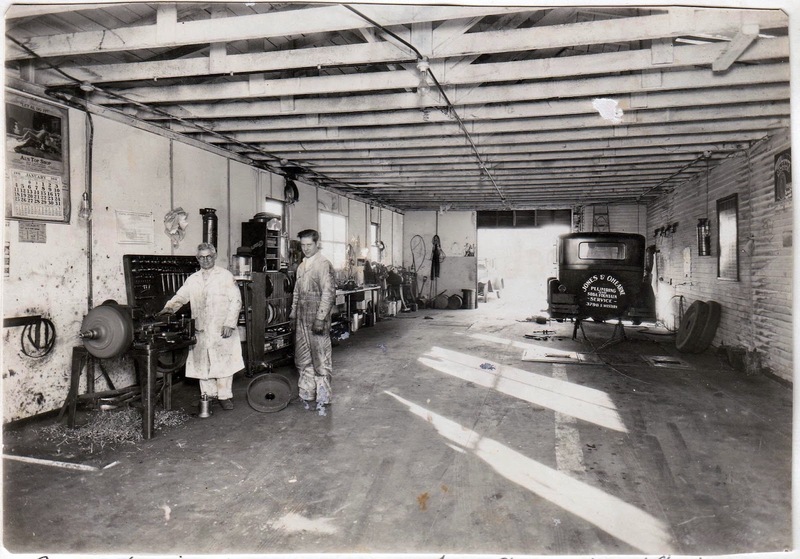 My regular readers may remember reading about my Grandfather, Arthur Harry Iverson, in my previous post I Found Clark Gable's Mechanic in the 1940 Census. Here are some close-up views from the above photograph. First up—my grandpa, Arthur Harry Iverson. 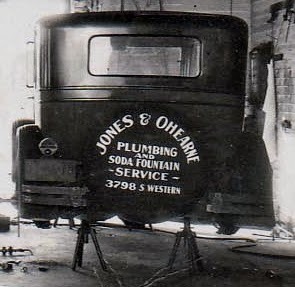 Don’t you just love this old car with the advertisement on the back? I have more photos of Arthur at work to share with you in our next installment of Arthur's On the Job! Helen was a sister of my paternal grandmother, Ingrid Anna Gilberg. 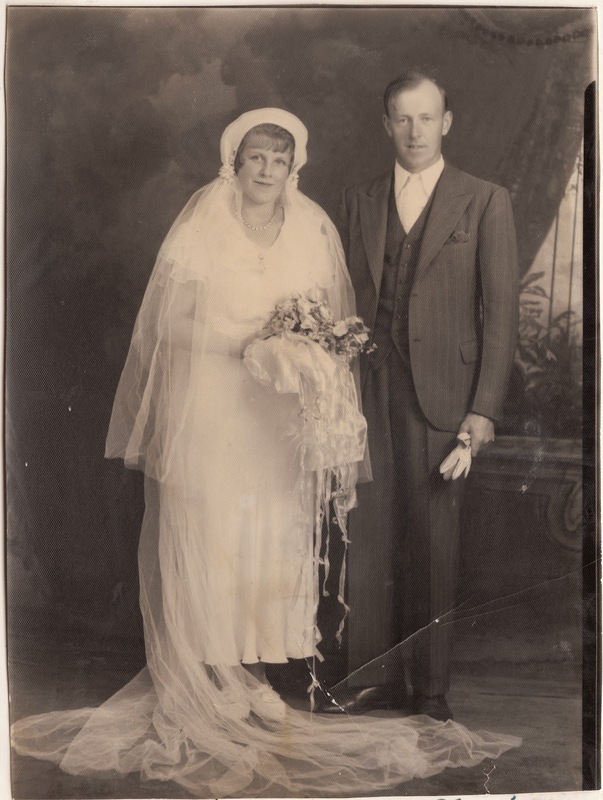 I first introduced you to my Grandma Ingrid in my previous posts Wedding Wednesday - Arthur Harry Iverson and Ingrid Anna Gilberg and Matrilineal Monday: Flour Sack Dresses–Ingrid Anna Gilberg. If you read the Flour Sack Dresses post, you saw that Helen was one of nine girls born to Carl and Hilda Gilberg. There was a son born to them as well, but he passed away at only 14 months of age. Helen and Nils, who went by Gus, were married in Los Angeles, California on June 30, 1934. 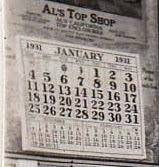 I’m not sure why my Grandmother Ingrid wrote 3 March 1934 underneath the photo. That actually wasn’t the correct date according to Nils Gustav Nilsson’s Petition for Naturalization. Aren't they a handsome couple? Don't you just love her dress and veil? And look at Nils holding his white gloves. How elegant! 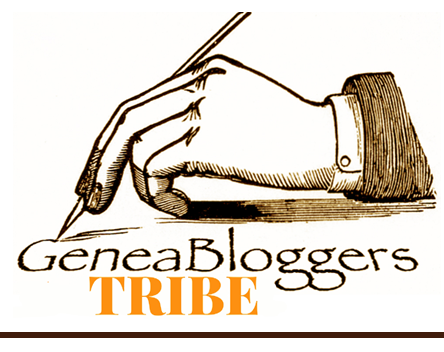 To read what other Sepia Saturday participants have written this week, just click HERE. DAR - Procrastination Pays! by Jollett etc. The next stop on the Webster Road Trip is Galena, Illinois. Why Galena? Well, the Historic Ulysses S. Grant Home is located there. Perhaps Uncle Rollin or someone in his family suggested they make a visit to this historic home. If so, it looks like they took his advice because the next photos and vintage postcards in Grandpa Debs’ photo album and scrapbook are from their visit to the U.S. Grant Home. What else do you see in the photograph? Of course, there’s the 1951 Chevrolet Sedan behind them. And on the picnic table? Among other things, I see a bottle of milk, a bowl of fruit and a saucepan on top of a portable stove. What can you see? You may recall from a PREVIOUS POST that the Websters bought camping equipment for their trip. Looks like they put it to good use! Looks like the Websters arrived safe and sound. Here they are in front of the U.S. Grant Home. Below is a photo of the U.S. Grant Home from Wikimedia Commons. Here's a postcard showing the U.S. Grant Home. And here we have the Parlor. There are four more vintage postcards from my Webster family’s visit to the U.S. Grant Home. I'll share them with you in the next installment of the Webster Family Road Trip. Fair warning…this will not be exactly wordless…. This is a photo of my 2nd great-grandfather, Ebenezer Perry Carlisle Webster. Don’t you just love that bow tie?! Ebenezer was a Civil War veteran. I wrote about him in a previous post titled Tombstone Tuesday–Ebenezer Perry Carlisle Webster. 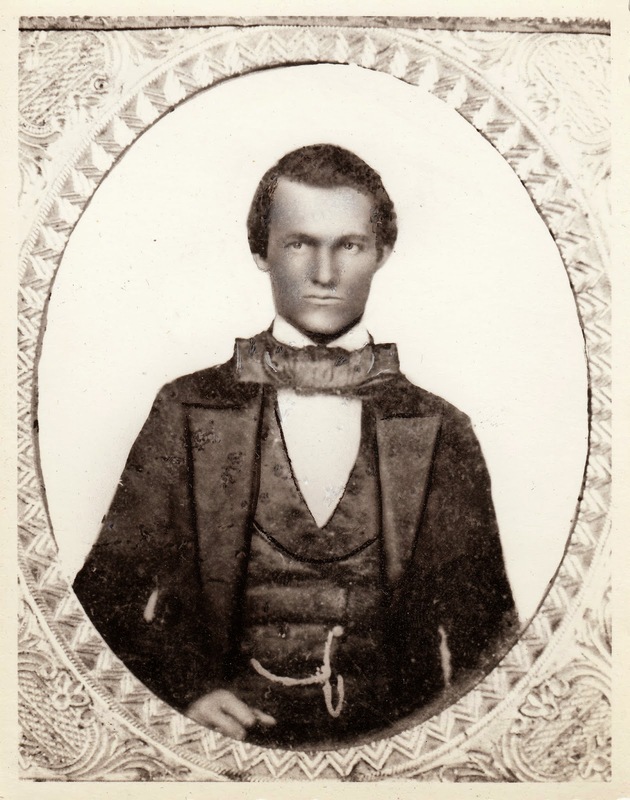 This photo of Ebenezer was taken when he was 18 years old, or about the year 1856, just a few short years before the start of the Civil War. 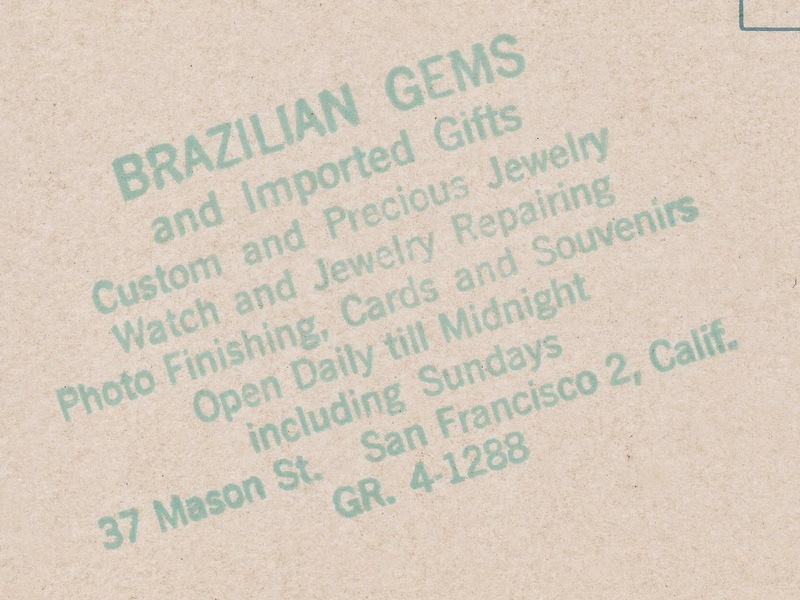 Below is the back of the photo. You can see what my Grandfather Debs Webster wrote about the photo of Ebenezer. Thank you grandpa for this information! This week’s Sepia Saturday theme has to do with salvaged bones with an interesting picture of a man and a dog. In addition to the obvious theme of an old man and a dog, Alan at Sepia Saturday suggested possible twists on this theme such as explosives, lubricating oil, fire resistant pain, etc. Well, I’ve decided to really twist today’s theme. I’m going with the word explosive. 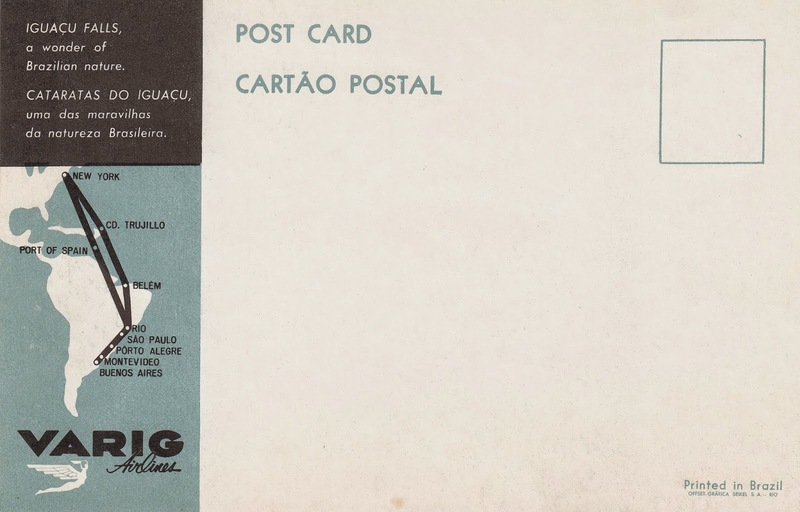 I think it works perfectly with the vintage postcard I’ve decided to share with you today. It shows the amazing Iguacu Falls on the border of Brazil and Argentina. 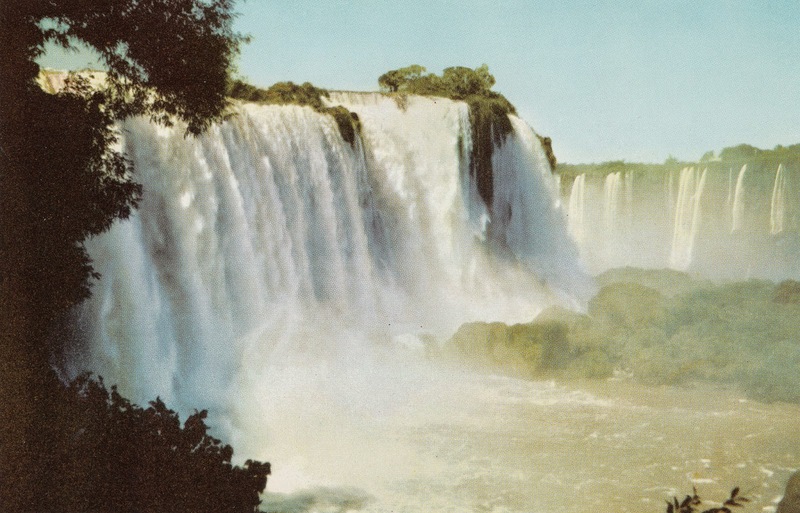 According to About.com - South America Travel, Iguacu Falls is taller than and twice as wide as Niagra Falls. 1. extreme in degree, power, or effect and 2. marked by bursts of destructive force or intense activity . Also listed are some synonyms that I think fit perfectly with today's postcard: tumultuous, turbulent, profound, and exquisite. I love that last one - exquisite! I think the following Youtube video shows just how exquisite these Falls really are. Enjoy! For more exquisite Sepia Saturday posts, just click HERE. Bye Bye New York, Hello Chicago, Illinois! Debs Webster and his family are on the road again! This time they are leaving New York and heading to Chicago, Illinois. The uncle he is referring to is Rollin Waterman Webster. He was a brother of my "Traveling Dentist Great-Grandpa" Frederick Webster. I introduced you to sweet Uncle Rollin in this previous POST. Grandpa Debs’ 1952 photo album shows photos and a vintage postcard from Illinois immediately following those from near Palmyra, New York. With that in mind, I hope I’m correct in assuming they left Palmyra and headed directly to Chicago. If that was the case, then according to GoogleMaps, the trip would have taken about 10 hours! My uncle also said that my Grandpa Debs was the only one in the group who knew how to drive, so guess who drove the whole way! According to a letter from Uncle Rollin to my Grandpa Debs, the last time they saw each other was probably sometime before 1923. So I can imagine how exciting this must have been for them to see each other again after so many years! Actually about 29 years! In 1952 Uncle Rollin would have been about 80 or 81 years old. 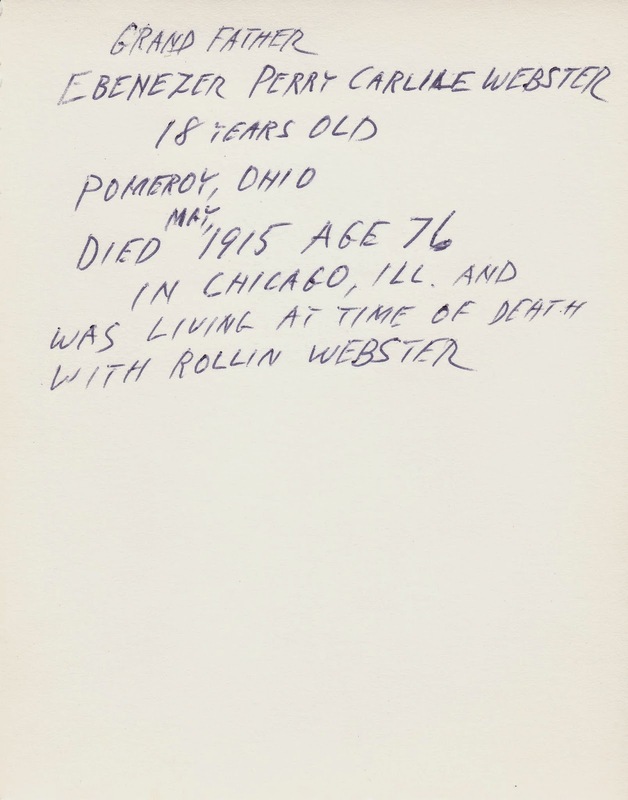 The photo below of Rollin was taken in June, 1952 in Chicago. The young man behind him is his grandson Billy. In 1952 Rollin was living at 8937 South Paulina Street in Chicago. According to Zillow.com, his house was built in 1924. Today’s stats say it is 1,087 square feet in size, and has 1 bathroom. It doesn’t list how many bedrooms it has though. The following photo of Rollin was taken in 1942 at the Chicago Loop. Here’s a map of the Chicago Loop from Wikimedia Commons. 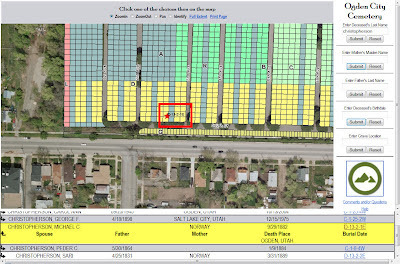 It was created using OpenStreetMap.org. Ever heard of it? I hadn’t until I wrote this post. It seems pretty cool. And yes, I’ve added the website to my blog’s Research Toolbox. Here’s the LINK to the Chicago Loop map on OpenStreetMap.org. I don’t know how long my Grandpa Debs and his family stayed in Chicago visiting Uncle Rollin and his family, but I’m sure they had a wonderful time. Unfortunately, it is time to get going again for Debs and his family. The next photos and vintage postcard in Debs’ photo album are from Galena, Illinois. Why did they stop in Galena, Illinois? Tune in next time to find out. 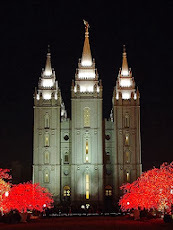 My regular readers may remember that my family and I spent an enjoyable time in Utah on vacation recently. I wrote about it in my blog post I'm Back!!. We had a great time together. And as any other good genealogist would do, I planned a couple visits to local cemeteries while we were there. One of the cemeteries we visited was the Ogden City Cemetery. If you have ancestors buried in this cemetery, be sure to check out the cemetery's link. 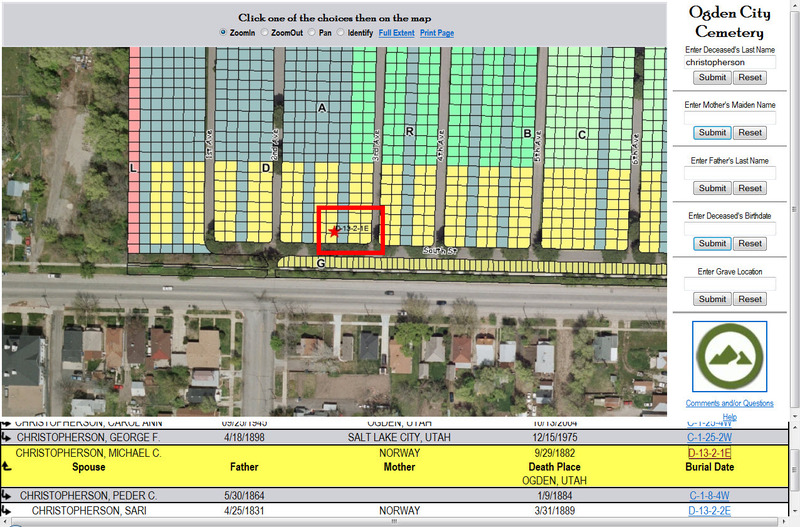 This website allows you to search for your ancestor's burial plot and see it on a map. Very cool! Buried in this cemetery are several of my Christopherson ancestors from Norway. 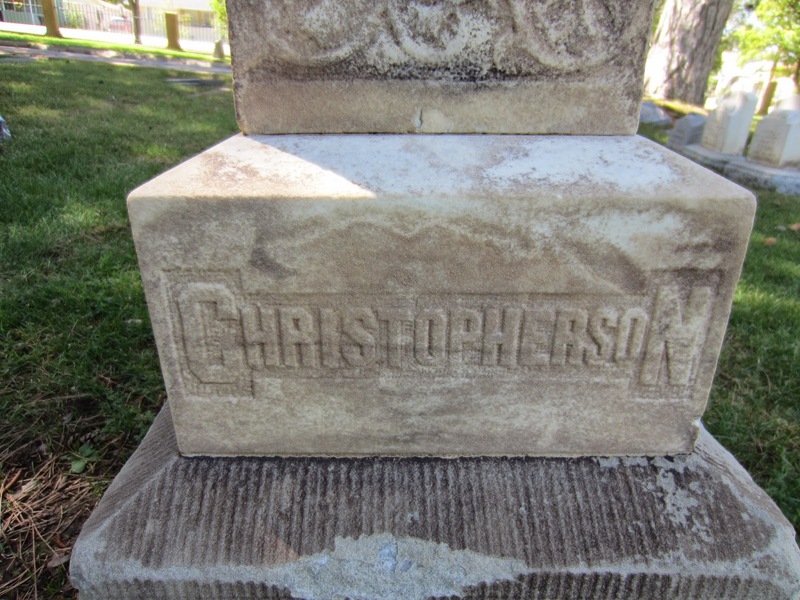 Today’s post will focus on my 3rd great-grandfather, Michael Christian Christopherson. 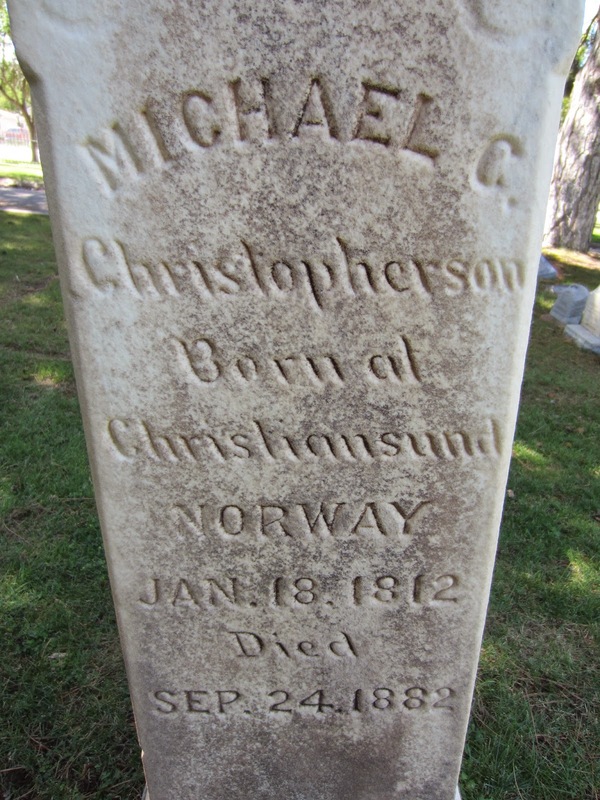 Michael was born on January 18, 1812 in Christiansund, More Og Romsdal, Norway. He was the son of Christopher Christiansen and Peternilla or Petronella Mikkelsdatter. Michael and his family immigrated to the United States sometime between 1867 and 1875. 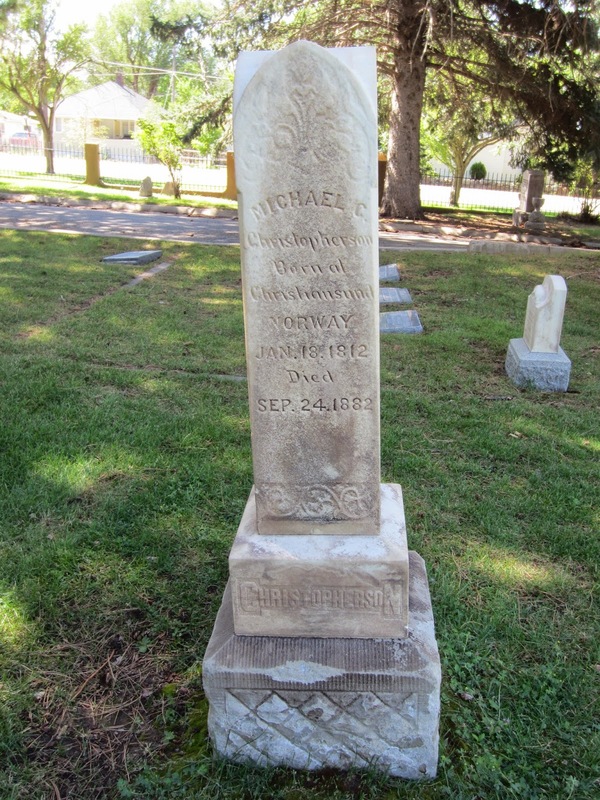 Michael died on September 24, 1882 in Harrisonville, Weber, Utah. More on this family in future posts. Here he is again, that traveling dentist great-grandpa of mine, Watson Emory (Frederick) Webster. 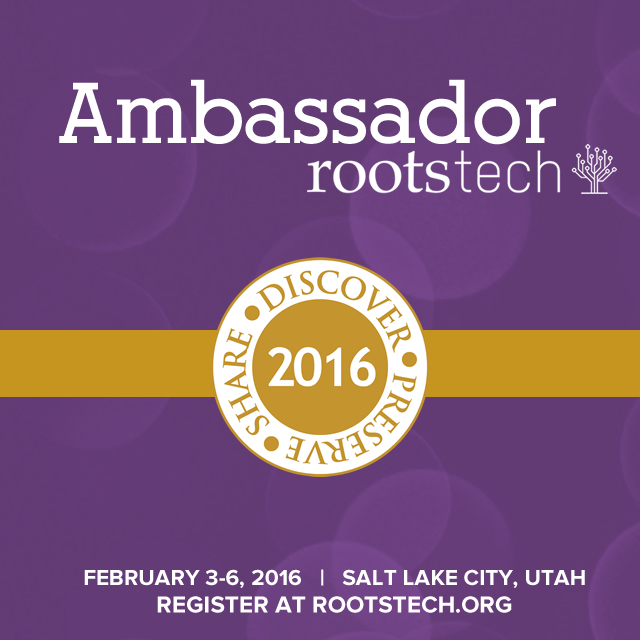 For those who want to find out why I refer to him as my “Traveling Dentist” great-grandfather, simply click HERE. If you look closely at this photo, you can see his Dental Office sign on the building behind him. ﻿I believe the three little kids in the doorway are my grandpa Debs (far right front), and his sisters Edna (next to Debs), and Carlota (behind). Also interesting to see is the bike itself. It’s sitting on a triangular bike stand (rear wheel). The motor is visible and if you look closely at the handlebars you can even see a bulb horn. And behind the seat is a small attached bag for carrying various items. Now, I don’t know if this bike came motorized or if my great-grandpa added a motor to his regular bike. In my research for this post, I haven’t been able to find a motorized bike that looks just like this one. What do you think? If anyone familiar with historic bikes knows the answer, please share in the comments below. To see what other Sepia Saturday participants have written this week, cycle on over to Sepia Saturday.